Here’s two more, slightly larger, diagonal number link puzzles – these are 8×5. The problem with diagonal number link is that it’s very hard to constrain the puzzles to a unique solution without making them really quite easy, since lines essentially can’t run parallel for more than a couple of squares, otherwise they could swap over and back and produce at least two different solutions. So in fact once you get over the slight confusion of diagonal lines, diagonal number link actually turns out to be easier I think, and these two puzzles do demonstrate the relatively easy nature – they can both be solved logically without too much effort. However I found them quite fun, none the less! Please see previous posts for the rules of number link and diagonal number link. If you thought toroidal number link was tricky, then how about diagonal number link?! In this variant the rules are exactly the same but now you can use diagonal lines as well as horizontal and vertical lines! The diagonal lines can only travel between diagonally-adjacent (diagonally touching) squares, and diagonal lines are allowed to cross. This is because the Number link rule is that “each square can only have a single line in it” – in the case of diagonal numberlink this does actually allow the lines to cross at the corner of certain squares. So just draw one line per pair of identical numbers, linking them together. 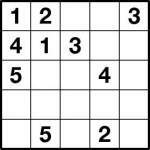 In the unique solution all squares are used. The first 4×4 puzzle is very easy but despite being very easy it’s still a bit confusing to actually solve, so I’d suggest trying it first. 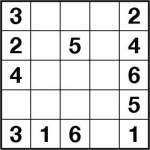 The 5×5 puzzle isn’t exactly difficult either, but it might at least give you a minute or so of amusement! I found it quite interesting to solve at least. 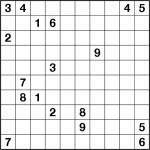 When I first tried a Number link puzzle a few years back I didn’t like it at all – it wasn’t immediately clear how to go about solving it, and I didn’t see how I’d ever find it fun. However jump forward to now and I find them really enjoyable, perhaps because it usually is hard to know how to solve them and so you need some fresh thinking each time you try one. It’s not the only puzzle I’ve had this experience with. There’s a box-shading puzzle called Heyawake that I found horribly mechanical and tedious when I first tried one, probably because at that point I could only tackle the easy ones and so mainly I got stuck when I failed to spot where I could directly apply a solving rule. However a couple of years ago I tried it again and it soon turned into one of my absolute favourites, although it hasn’t quite pushed Nurikabe off its crown of being my personal number one. It works in reverse too, however. 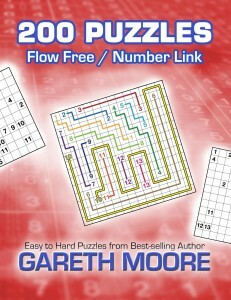 I used to really enjoy Filomino puzzles, but now I mostly find them rather dull – I think that once you get good at certain puzzles you hit a natural wall in difficulty where making them any trickier without requiring what is essentially just guesswork is a real challenge, so you find most puzzles mostly easy. 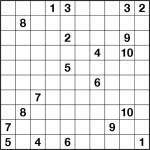 In a great puzzle (like Sudoku), you’ll always find some puzzles tricky no matter how knowledgeable you get, but not all puzzle types behave so gracefully. The point of all this is that Number link is one of those puzzles that – for me at least – always presents a challenge, and makes me think anew each time I try one. And because it can be infuriatingly tricky it’s also capable of giving me a great deal of satisfaction when I do solve a puzzle. The Number link examples I’ve posted so far have been pretty easy, so I thought I’d post a few more that were a bit harder. 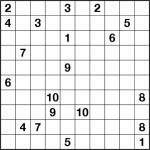 All of these have at least a couple of obvious moves, so it’s certainly possible to make trickier 10×10 puzzles than these, but they do present at least a bit more of a challenge. I’ve arranged them by what I considered increasing order of difficulty, but you may disagree, depending upon how inspired you are as you tackle each puzzle! 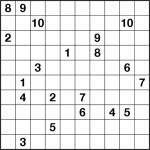 The rules are simple: connect each number to its identical partner using only horizontal and vertical lines. 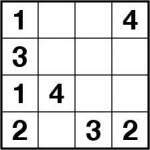 Only one line may pass through a square, so lines cannot cross or overlap. There is only one solution. 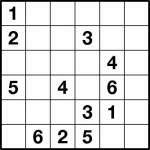 In all of these puzzles the unique solution also uses every square. Both of these last two facts are very useful in narrowing down possible solutions! Take a look at my previous posting for an example solution. 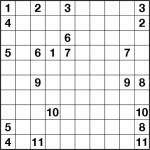 Edit: The first version of this post included a puzzle (number 2) that had lots of different solutions that didn’t use all squares – I’ve now replaced it with an alternative puzzle. See comments. I’ve had a couple of emails and comments suggesting that it would have been easier if I’d included an example with yesterday’s Number Link puzzle, so I’ve made up for that today with both another puzzle (10×10 this time, and not too taxing I hope) and a small 6×6 example of what a finished puzzle would look like: each pair of numbers is linked by a line which travels horizontally or vertically through the squares, and no square is visited more than once (and therefore no lines cross or overlap at any point). Over the past few years I’ve made at least one example of pretty much every reasonably popular Japanese number puzzle, but with one notable exception: Number Link. 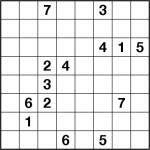 In this puzzle the aim is to draw lines connecting squares with identical values in, but without these lines crossing over or visiting any square more than once. The lines can also only travel horizontally or vertically, not diagonally. 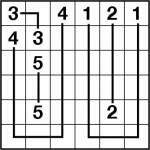 This assumption means that whilst solving a puzzle you can make various deductions about how lines can and cannot go based on noting what would make a puzzle non-unique, or not use every square. Once you discard these assumptions (as you need to do when creating the puzzle, since you can’t assume uniqueness without proving it!) it’s typically much harder. It stands to reason that as puzzles get larger that they can get much trickier, but that isn’t always the case: today’s first example puzzle, whilst quite large at 20×9, is actually really easy, as you’ll probably find out when you try solving it!